Sonia Falcone with Color Field installation at the 1st Montevideo Biennial, 2012. 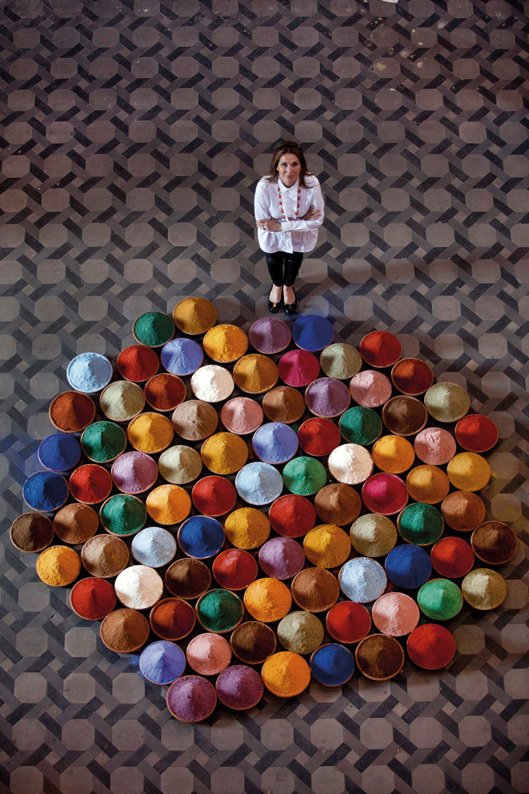 The spices installation Campo de color [Color Field] by Sonia Falcone (Bolivia) spreads out like a landscape of sensations and provokes synesthetic perceptions. Sweet blue, fiery red and bitter gold give off a swirl of fragrances; an intense irradiation of all the qualities of matter. As in its original meaning, aesthetics is in this installation, Campo de color [Color Field], a sensation. Throughout history, spices have motivated marine exploration and trading routes and here inspire the creation of a new landscape. Falcone covered the floor with hundreds of clay pots filled with cocoa, cayenne, chili, annatto, pepper, cinnamon, turmeric, thyme, mustard, curry, paprika and more – a rich variety of spices to create a minimalist composition in the color field style. Unlike the smooth, cold surfaces of North American minimalism, Falcone’s visual feast displays reliefs composed of pulverized flavors, as hot as Latin American chili or as sweet as Oriental cinnamon. While the routes of the spices linked Asia to the ports of Venice in the Middle Ages, Campo de color completes the cartographic picture by drawing in the palette of flavors from the New World. Landscape, banquet, market and altar; these earthbound elements trigger heady sensations and at the same time recall the body’s perishable limitations, the ephemeral nature of sensory pleasure and – ultimately – the fleeting nature of life. Excerpt from The Atlas of the Empire, by Alfons Hug and Paz Guevara, curators of the Latin AmericanPavilion. Istituto Italo-Latinoamericano (IILA). 55th Biennale di Venezia.